Books are powerful. They transport readers and broaden horizons. Words are the medium of growth. These are the ideas behind One Book One LCC. One Book One LCC is a community reading experience. During the 2015-2016 academic year, all members of the LCC community - students, faculty, and staff – are encouraged to read The True American by Anand Giridharadas. The book offers a rich opportunity to engage with issues such as race, religion, health care, the American criminal justice system, and more. The greater Lansing community is invited to participate as well. 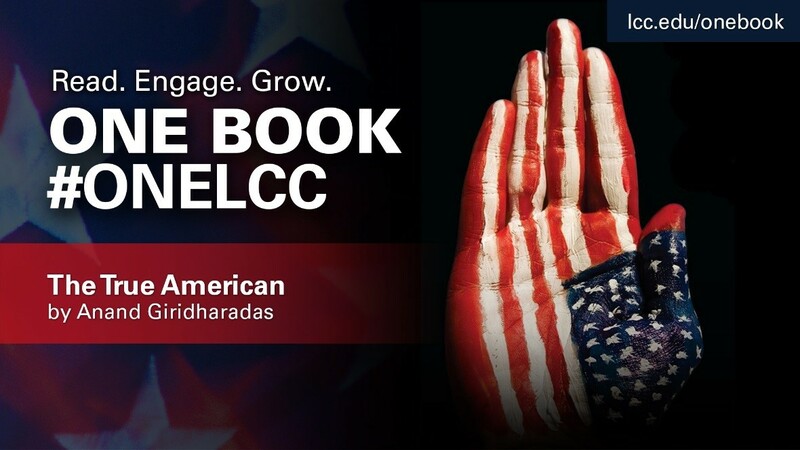 To enhance the experience of the book, special events, discussions, and college-wide conversations are planned, including possible visits from Anand Giridharadas and Rais Bhuiyan in spring 2016. One Book One LCC embodies high-impact educational practices and supports our students’ achievement of essential learning outcomes in many ways. One high-impact educational practice is a common intellectual experience. A community read can center college-wide intellectual conversations and activities; and the more courses that include the book, the broader the experience. A second element of high-impact educational practice is the first year experience. Here at LCC, students who take our first year experience course are required to read the One Book One LCC selection, where the book serves as a focus for assignments and conversations. The One Book One LCC selection can also serve as a platform for writing across the curriculum – another high-impact practice. Furthermore, while a community read does not meet the formal definition of a learning community as a high-impact educational practice, it does grow a community of learners. Finally, engaging with a common read helps students achieve essential learning outcomes such as intercultural knowledge, civic engagement, critical thinking, and ethical reasoning. To learn more about One Book One LCC and to participate, visit the website or contact Susan Murphy. Her telephone number is 517-483-1645.